Talk 'N Text vs. Rain or Shine Game 1 Semifinals PBA Commissioner's Cup 2014: Date, Time, Live Stream, TV Info and Preview - Balita Boss! The Talk ‘N Text Tropang Texters and Rain or Shine Elasto Painters are set to start their best-of-five semifinal round in the 2014 Philippine Basketball Association (PBA) Commissioner’s Cup on Monday, April 28 at Smart-Araneta Coliseum in Cubao. Game 1 is set to start at 8:00 p.m. Philippine Standard Time (PST). It will be broadcast on TV5. Live stream will be available via News5 Everywhere (TV5). 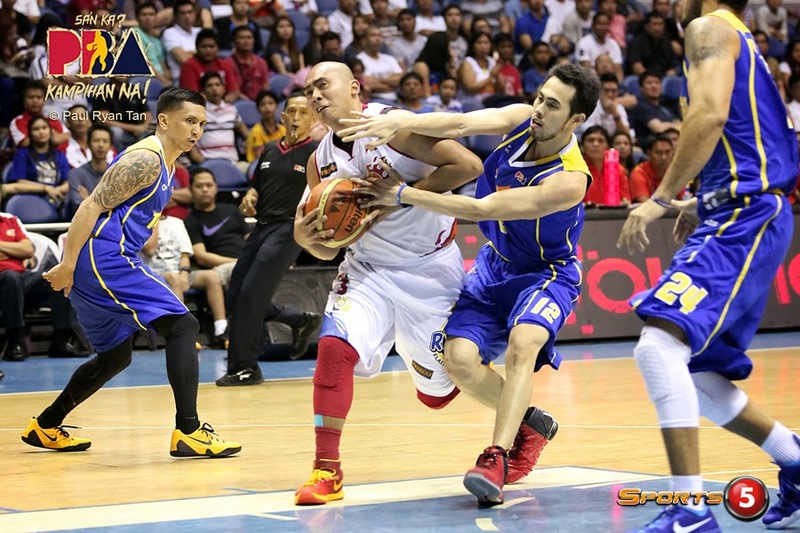 The Tropang Texters grabbed the number 1 seed with unbeaten record in the elimination round. The Elasto Painters, the number 4 seed after the elimination round, defeated Meralco Bolts in the quarterfinal round to earn a return trip to the semis. As of now, Talk ‘N Text has won all of its games in the Commissioner’s Cup including the quarterfinals game against Barangay Ginebra San Miguel. With a perfect record, Talk ‘N Text is the best team. Rain or Shine’s head coach Yeng Guiao wants to defeat Coach Norman Black and the rest of the Tropang Texters in order to be called the best team. In the elimination round against Rain or Shine, the Talk ‘N Text played the entire second half without their import Richard Howell because of injury. Howell left the game in the second quarter after falling down on his shoulder hard on a play. But still, the Tropang Texters survived the Elasto Painters 85-82 on April 9. KG Canaleta was named Player of the Game with 19 points and eight rebounds. Rain or Shine’s import Wayne Chism led the Elasto Painters with 18 points and 10 rebounds.